Vile Blog's interview with 19th Street Production's director. Derek Ahonen, Playwright and Director of 19th Street Production’s ‘Catherine & Anita’ interviews about the Edinburgh Festival Fringe performance. What was the inspiration for this performance? I had wanted to write a one person show for a decade, but never had a fully formed idea. When Sarah Roy, the star of the show, came to me last year with the thought of collaborating on a one woman show, I actually had some realistic thoughts. So it had to be a play about mental health that doesn’t break the fourth wall and whose mission isn’t to showcase an actor’s range through multiple characters. 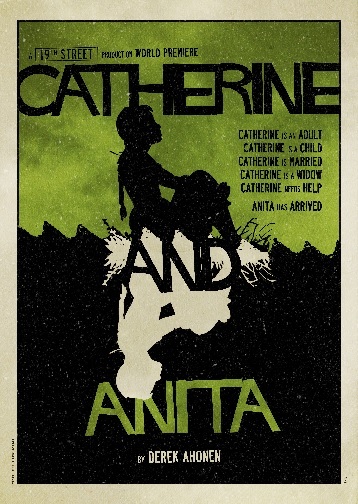 So Sarah and I spoke at length and loved the concept of what will result in the production of CATHERINE AND ANITA. Is performance still a good space for the public discussion of ideas? It’s as good as any other forum for ideas. The medium itself may be the best space for intelligent debate. The more important question is whether the time spent on building an idea is worth it when the number of people who will participate in such a discussion is incredibly limited. How did you become interested in making performance? I don’t know. There’s a lot of time on earth to fill and I haven’t found anything better to fill it with other than this. Is there any particular approach to the making of the show? Each show is different. But I do like to spend a lot of time at the table before we get on our feet. The table is the fun part. It’s about learning the language. The getting on the feet part is about solving problems. Does the show fit with your usual productions? Not even close. This is a one woman show. The past five shows I’ve written have been with large casts. A couple have had over 25 actors in them. But my artistic sensibility and my world view are very much consistent in all productions including this one. I call them all Gallows Humor Dramas. My plays are all about people that are laughing their asses off while the ship is sinking. What do you hope that the audience will experience? Disorientation. Humor. Maybe some tears. Mainly I want them to be entertained and for time to disappear. This is where artists can really sound pretentious. So I try to keep my conversation to this question limited. What strategies did you consider towards shaping this audience experience? Again… I don’t want to know how a magician does what he does. I’m just grateful that he’s trying to entertain me.